For some, the title "Dial a Narc" may conjure up visions of an anti drug SWAT team kicking in a door. However, for deep divers, it is a phrase commonly used when discussing breathing gas mixes that include helium. It means that by simply replacing some of the narcotic gas "nitrogen" with the physically inert gas "helium," a diver can actually predict and control the level of nitrogen narcosis for any dive. 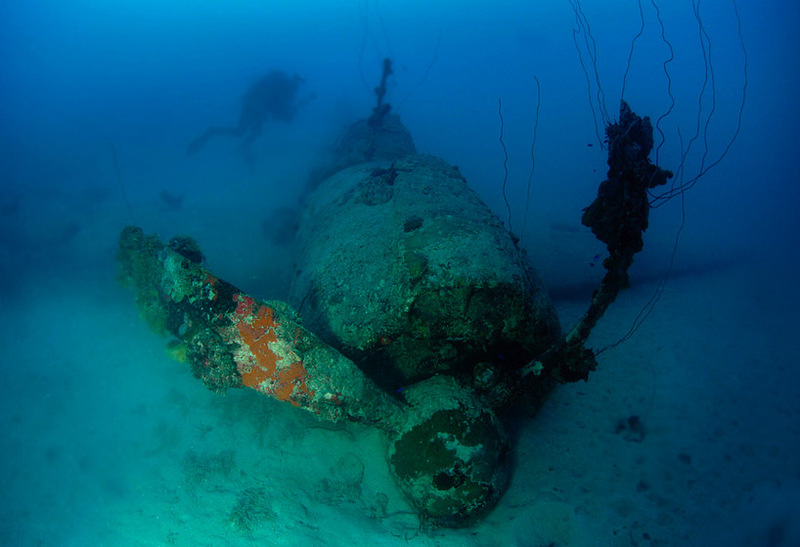 Imagine diving a pristine wreck with her upper decks sitting at 200 fsw. Some divers would make this dive on air, and, yes, there would be measurable narcosis. This narcosis could range from a reduced level of function to total debilitation. Much would depend on the individual's physiology and the diving conditions. Dark, cold, CO2 retention, fitness level, and physical exertion all play a role in the level of nitrogen narcosis. Consider the same 200 fsw dive with some of the nitrogen replaced by helium. According to the accompanying tables, by transfilling 1080-psi of helium into a 3000-psi cylinder, then topping up the remaining 1920 psi with a 32% nitrox mix, the final mix is 20% oxygen, 44% nitrogen, and 36% helium. This is a mix with enough oxygen content to sustain life at the surface, which means that no travel gas is required. It also has a nitrogen narcosis level that is equivalent to an air dive to 96 fsw and the PPO2 is 1.45. Just think, now a diver can explore that deep wreck with a totally clear head. While this is exciting, it is important to remember not to dive mixed gas without the proper training. Decompression requirements and equipment configuration, among other things, are quite different from diving air. Many blenders find that helium mixes are actually easier to mix than enriched air nitrox. Helium mixes are generally both helium and oxygen (Heliox), or a helium, oxygen and nitrogen mix (Trimix). Although mixing the three gases separately will work, blenders usually take advantage of available combinations, such as air and nitrox, to mix with helium. Mixing helium with air (Heliair) or helium with nitrox (Helitrox) is accomplished by partial pressure filling a cylinder with pure helium, then topping up to the final pressure with air or nitrox. Introducing a "Nitrox Stik" into a standard scuba compressor can turn an otherwise simple air only unit into a complete gas blending system. Illustrated below is a "Nitrox Stik" used to either fill nitrox straight into scuba cylinders, fill nitrox storage banks for later use, or on top of helium to create helitrox. The only pieces added to the system are the "Nitrox Stik" system, oxygen analyzer, banked oxygen, and banked helium. 1. Find the desired maximum depth. 2. Choose the desired ending scuba cylinder pressure. 3. Intersect the desired depth with the helium psi required on the table chosen. Fill an empty scuba cylinder with the required psi of helium. 4. Top off the scuba cylinder to the ending pressure on the chart chosen with the required percentage of nitrox. Above: ADM has provided these easy to use helitrox-blending tables. 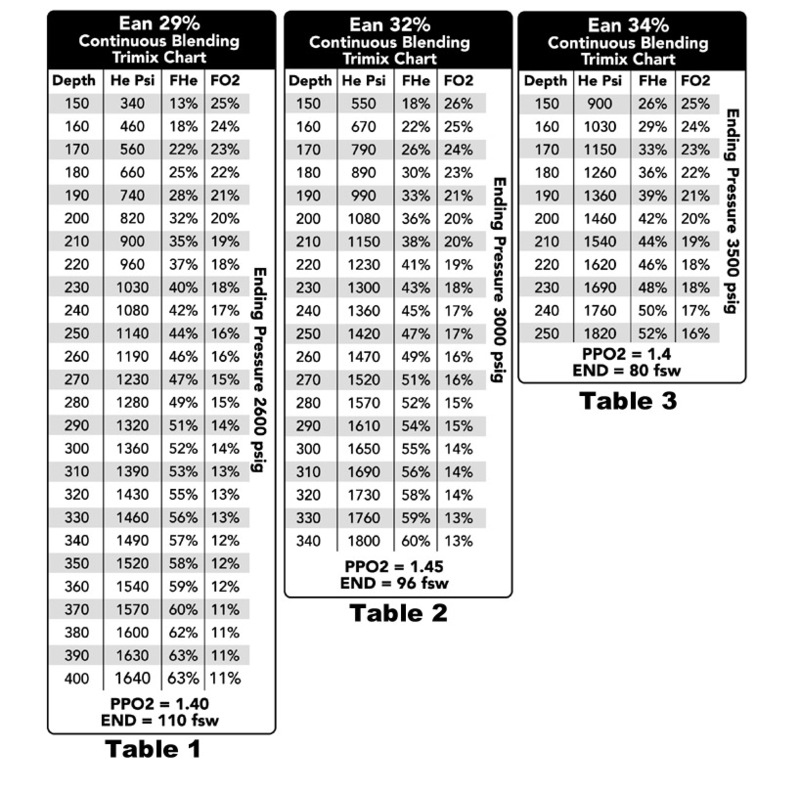 Each table uses a different nitrox percentage, ending final pressure, PPO2 and END. Table 1. Ean 29% is placed on top pre-filled helium to an ending pressure of 2600 psi. Table 2. Ean 32% is placed on top pre-filled helium to an ending pressure of 3000 psi. Table 3. Ean 34% is placed on top of pre-filled helium to an ending pressure of 3500 psi. The PPO2 and END, indicated on the bottom of each table, has been calculated +/- 0.03 PPO2 or +/- 3 fsw END for each depth and mix. To do this, the diver will need a partial pressure fill whip, with a 580 CGA fitting for the helium cylinder on one end and an accurate pressure gauge, micro metering valve and SCUBA cylinder (either yoke or DIN) on the other end. Additionally, plan on either obtaining a booster pump for the helium or cascading the cylinders to be able to utilize the lower cylinder pressures. For Helitrox, an accurate method of delivering nitrox is required. By far the simplest, safest, and least expensive way to mix gases is the continuous blending system called the "Nitrox Stik." The "Stik" mixes low pressure oxygen with the compressors' intake air through a patented static mixer. It creates a homogeneous gas mix, without restricting the flow to the compressor. The result is an inherently accurate nitrox blending system that makes nitrox as easy as pumping air. Technically, because of the different compressabilities of the gases, "real" gas laws should be used. Although, the reality is that gas blenders treat the gases as if they behave the same when compressed. This is called "ideal" gas laws. With experience, some blenders develop an intuitive "fudge factor" to take into account the differences, but for most blenders, just following the "recipe" will get remarkably accurate mixes. To mix Helitrox, first consider the maximum depth of the dive. Decide the desired equivalent narcosis depth and the maximum PPO2. Enter the tables at the desired depth, and note the amount of helium to trans-fill into a cylinder. Top up the cylinder with the indicated nitrox mix to its ending pressure, and analyze the oxygen content. For example, if the maximum depth of the dive is 280 fsw, note on the EAN29 table (table 1) that by transfilling 1280 psi of helium into an empty cylinder, then topping up to 2600 psi with EAN29, the final mix will have 15% O2, 36% N2, and 49% HE. The PPO2 for this mix, at our maximum depth of 280 fsw, is 1.4 and the EAD is 110 fsw. Is it really this simple? Yes, but there are several points to keep in mind. 1) With one strike against divers due to the differing compressibility of gases, do not compound the problem by allowing gas temperatures to vary. Let the cylinder cool to ambient temperature between gas additions. 2) When diving the mix, watch your oxygen. If the oxygen fraction is too low at the surface, you may require a travel gas to get to a depth (pressure) where the PPO2 will sustain life. A minimum of 16 % oxygen is required to support life for a human being at rest. This is really only an issue with Heliair. Conversely, too hot of an oxygen mix (above a PPO2 of 1.6) may become toxic. This is very easy to do with Helitrox. 3) When mixing, ensure that the nitrox or air is introduced at a relatively quick rate to create enough turbulence to thoroughly mix the gases. Most blenders will fill to approximately eighty percent of the desired pressure, creating turbulent flow. Then let the cylinder cool to room temperature before very slowly (cool) filling to the final working pressure. An alternative is to let molecular migration take place by letting the mix stand overnight. If in doubt, tumble the tanks. Check for a homogenous mix by analyzing the oxygen at intervals until the result is constant. Once mixed, the gases will not separate. Learning how to safely dive helium-based gas mixes is only half of the formula. The other half is the ability to consistently blend accurate mixes. With the right equipment and the knowledge, the equation is complete.